The cost could be nothing or could cost you a few quid depending on what you needed of course. The biggest expense being the chrome lever itself. The mounting tray and the lever on the outside were galvanised by the looks of it so only a little surface rust was evident. As the car had to be stripped this was always an untidy part of the car inside. The inside was full of dried rust and gunge. not that you would see it of course but it drove me made as I knew it was there. So it was time to strip and clean it down. The first part is the T-handle at the top of the lever. This is held in by a tiny grub screw that needs a proper fitting Allen key to remove it. If you can’t get it undone then it will be the drill out and re-tap the hole for a larger grub screw. With the T-handle of you can lift the console plate of and the gear indicator plate as well which is held in place by four screws on the top. when you have got to the mechanism itself unhook the gear change linkage to the gearbox underneath. Four screws hold down the whole thing on top of the tunnel. Undo the screws and the unit will come out in one go. The opposite side to the mechanism is the rubber bung which hold the lever to the linkage arm. Gently pull the bung away as it may be brittle and tear, if you want to use it again of course. With the bung removed you can see the 9/16 nut on the end of the linkage arm. This was not done up tight but just enough to hold it in place. Undo the nut through the bung and remove. Next is to remove the arm linkage out. this was moving but was a little tight, so I got a punch and lightly tapped the linkage out from the bottom of the lever. a few taps released it for me. 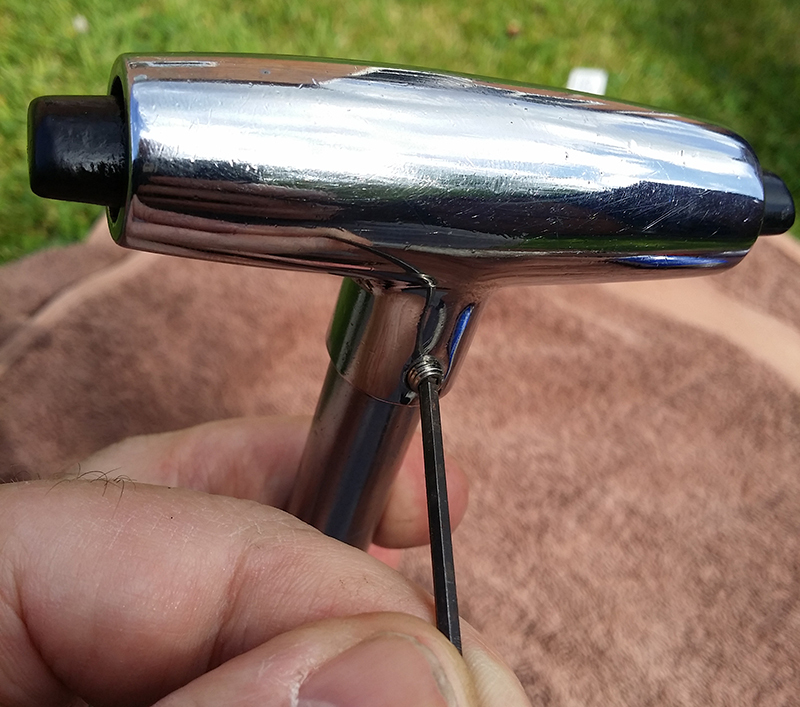 The chrome lever is now free to pull out and put to one side to clean up later. Before removing the linkage arm there are two plastic bushes that sit inside the bore. Check there is no movement and all is still tight. If not replace the bushes. To be fair there is not really much wear on these parts as it’s in gear it stays there as such. Pull out the arm with the bushes and keep safe. Now everything is apart you can clean up the base (as I will call it). I used a wire brush to see how bad it looked and it came up pretty clean almost straight away. Inside the base was little more difficult due to the combined space you have to work in. I used some POR15 Metal Ready to stabilise the light rust and washed it off as required. I sprayed the base when it was dry with coats od Eastwood Rust Encapsulator. Assuming that the all the parts have been cleaned of course for the chrome work. The first part is to reattach the plastic bushing to the linkage arm and apply generous amounts of white grease. Place from the outside in the linkage arm and insert the other bush on the arm on the inside. Again coated with generous white grease all round. Push the arm all the way through making sure the bush sits flush on the inside. 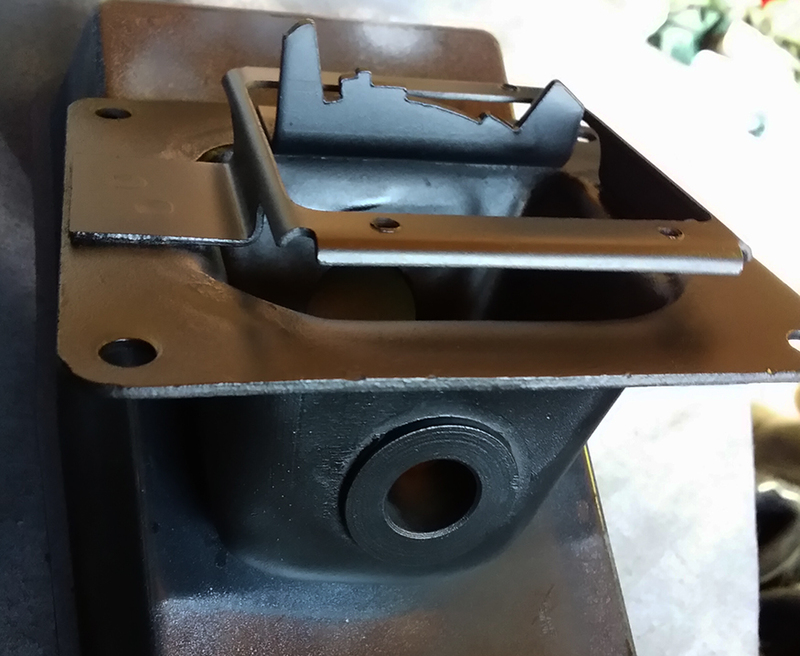 With the arm in place fit the shift lever to the arm flats which can be seen on the picture above, you may have to lift the gate mechanism to allow it to fit properly on the gate steps. From the outside in add the nut and tighten up making sure the lever is pulled onto the arm. 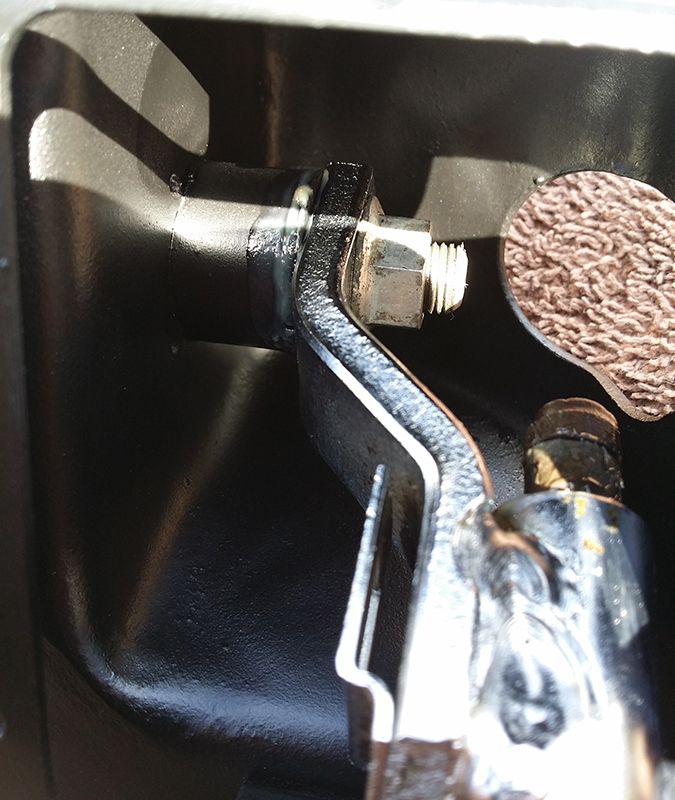 Do not over tighten the bolt otherwise you will not be able to move the shifter and cause heavy wear on the bushes. Tighten to feel a little resistance and not to loose either. Next is rubber grommet. This was a little brittle and a small part of the retaining lip on the inside had come away. I used a mixture called plumbers mate which is like a putty but never dries and is waterproof. It will even stick underwater! I rolled out a thin length and wrapped it around the outside of the grommet. When fitting the grommet this will only fit on one way round and there is not to much difference. Make sure you fit it the right way up. I applied the grommet and squashed it into place and smoothed of the excess putty. With the bottom section all in place I gave another squirt of grease about to make sure all parts were covered. The T-Bar at the top was then fitted and the grub Allen bolt was tightened up. (This will have to be removed again to fit the console and the shifter plate). The whole thing looks like new now. The only thing is there is a few wear marks on the chrome that is not really visible. I wanted to keep the shifter original as it looks like it has been used. I am very pleased with the way this has turned out.